Are the other candidates chasing second place to David Davis? It seems to have been running for longer than Les Misérables, but the race to become Tory leader is finally getting to the voting stage. The leading men have all had their say and by the end of the week only two will remain standing and go forward to the final ballot of 300,000 Tory party members. Yet even now, as Tory MPs prepare to have their first say, the curtain call remains a long way off and only the most foolhardy or thrill-seeking of punters would be ready to bet any large amounts of cash on the final outcome. Long-time favourite David Davis still has far and away the largest number of Tory MPs backing him - a position he has held since the contest began. Young moderniser David Cameron has gradually eased his way up the field to become the bookies' favourite. Big beast Ken Clarke, once seen as a near certainty for the final run off, is looking vulnerable. And outsider Liam Fox has lived up to his early form as a dark horse who could yet confound all predictions. 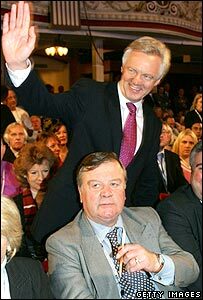 Mr Davis is widely believed to have damaged his chances with a lacklustre party conference speech earlier in the month. Mr Cameron, on the other hand, boosted his campaign from the same platform and has gone on, it appears, to weather a media storm over drugs. Mr Clarke has attempted to neutralise Europe as an issue for his candidacy, with mixed results. And Dr Fox has appealed to the right with pledges not to trash the party's past record. In other words, this race is as wide open now as it was the day it kicked off - possibly more so. A glance at the voting intentions of the 198 Conservative MPs shows just how difficult it is to predict the outcome. For a start, around 50 have kept their plans to themselves - more than enough to throw out all the most careful calculations. But the real complication comes from the battle for second place. It is still expected that Mr Davis will go through the first ballot on Tuesday to the run-off on Thursday, which leaves Mr Clarke, Mr Cameron and Dr Fox battling it out to hang on. There's virtually nothing between Mr Clarke and Dr Fox, with Mr Cameron just 10 declared votes ahead, so tactical voting will almost certainly come into play. It is a dangerous game and one which ended up last time around with Iain Duncan Smith facing Mr Clarke. This time, Davis supporters determined to ditch Mr Clarke may well vote for Dr Fox in the belief their favourite is certain to go through anyway. But what do the "stop-Cameron" MPs do? Vote Fox? And what about those eager to defeat Mr Davis, should they congregate around Mr Cameron in the belief he is a certainty with the grassroots? The calculations are enough to give a bookie a blown fuse - so there's plenty of room for it all to go horribly wrong. Again.